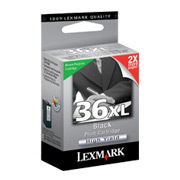 The #36XL black cartridge reflects a discount** compared to alternative cartridges in exchange for agreeing to return the used cartridges only to Lexmark for remanufacturing or recycling. *Non-refillable cartridge licensed for single use only. Return empty cartridge only to Lexmark for remanufacturing, refilling or recycling. A variable amount of ink remains when this cartridge must be replaced. Replacement cartridges (36XLA) sold without those terms are available through www.lexmark.com.